Flowing east to west, right through Missoula, Montana the Clark Fork River offers almost 200 river miles of great trout fly fishing. This is the Clark Fork of the mighty Columbia and all of our other rivers drain into it on its journey to the Pacific Ocean. Despite the fact that he apparently never actually saw it himself, the river now bears the name of William Clark, the co-commander of the Corp of Discovery and the Lewis and Clark Expedition. 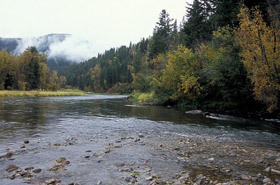 The river has held many names over its history, with its flow joining the Bitterroot in the sheltered wintering grounds of the Missoula valley. At the time of the first white settlers, it was called the Hellgate River, or Hellsgate River, and the steep canyon it carves just before entering Missoula is still called Hellgate Canyon. It is rumored that this was a popular ambush site among the warring tribes of Native Americans who followed this route from the mountains to hunting grounds to the east. It also appears that the town of Missoula got her name from a Native American name of the river meaning River of Ambush. This certainly enhances the stories. The Clark Fork River is a fly fishing success story regarding stream restoration. For recent decades, it has been a very good fishery, but remnants from past problems still haunted her. The Milltown dam on the Clark Fork, just above Missoula, Montana at the confluence with the Blackfoot was built over 100 years ago to manage flows for moving timber down the Blackfoot and Clark Fork. Although much of the damage from mining at the time has long been cleaned up, mining tailings had deposited behind the dam and a massive superfund project has removed the dam and sediments. Work continues to return the river to its original channel, but tagged fish, that had been restricted by the dam for 100 years, were found up the Clark Fork and Blackfoot shortly after opening the diversion channel. The upper Clark Fork had previously been considered mainly brown trout water, but more rainbows and cutthroats are being caught fly fishing between the dam to above the confluence of Rock Creek. Fly fishing the upper Clark Fork River, you will find great brown trout habitat with deep pools, riffles and undercut banks. At this point, before the added flows of Rock Creek, then the Blackfoot River, then the Bitterroot River, it is a much smaller river with a lot of grassy banks and undercuts for brown trout to hide and ambush prey. After the river gathers the volume of water from all of these other great streams, it becomes a much larger flow. At this point the Clark Fork flows through the town of Missoula, Montana as a much bigger, slower river with numerous springs bubbling into it. Dry fly fishing on this section of the lower river is mainly “match the hatch” fishing during the various mayfly hatches. The river holds a lot of rainbows and cutts in the 10”-18” range. Hopper/dropper and streamer fishing on the upper river is what produces those occasional 20” brown trout.